Hi McRoach-just wondering if you found someone to deal with on a sword? Be sure to check out all the links that have been posted. Hey Rindy, I'm still looking for a good deal on the medieval style, I'll check the links thanks! I just picked up a Ninja Style for the heck of it. We'll see if it gets here by Xmas. McRoach hope you found what you were looking for. Did you get your Ninja sword? It is about as far from the Olympic sport of archery as it can get. The bow is taller than the person shooting it, and, to the uninitiated, it appears lopsided and unbalanced. There are no sights, no high-tech stabilizers. And, of course, it is done on horseback, at upward of 40 mph. It's called yabusame, and it is the sport of the samurai. Each year, archers in feudal shooting gear climb atop their decorated mounts for a lively competition on the beach of Zushi, a town just south of Tokyo, galloping in the sand as thousands of onlookers cheer and shout. The first competition was held here in 1199. The scene is like something out of a movie by the great Akira Kurosawa. Banners flap in the ocean wind marking the beginning and end of the shooting runway. Little boys in bright robes and black hats scamper about collecting the arrows and the debris from the wooden or clay targets destroyed by each hit. "There is nothing like this outside of Japan," said Ietaka Kaneko, who heads the Japan Equestrian Archery Association and the Takeda School of Horseback Archery, which traces its origins back more than 800 years. The targets, held about seven feet aloft on small poles or scaffoldings, are roughly the size of a mounted opponent's chest. There are three along the runway, which is only 165 yards long, giving the archer just enough time to raise his bow, load and shoot -- three times -- all the while spurring on his horse. When the dull, turnip-shaped tip of an arrow strikes just right, the board explodes in a blur of splinters. But as often as not, the arrows miss, sailing past the targets and thudding into the canvas behind them. In battle, hitting the target was the whole idea. But yabusame has from its origins been almost as much an art as a sport. In many competitions, hitting the target is almost an afterthought -- archers are judged, if they are judged at all, on the beauty of their run and the form they display as they release each arrow. "Many schools today see yabusame as more of a ceremonial thing," said Kaneko, a retired veterinarian. "In our school, it is our earnest desire to connect." Yabusame in Japan is something like polo in England, or rodeos in America. Very few people actually participate in yabusame, because few have access to horses or the time to learn all the technique involved in riding them for sport. But Kaneko, whose family roots are in the now-defunct samurai class, grew up around them and his steeds were trained specifically for archery competitions. "I have been shooting since I was 17," he said. He's 87 now, and was on hand to officiate at this year's beach competition. "The most difficult part is staying absolutely stable no matter how fast the horse is galloping," he said. Archers don't actually sit. They squat, using special stirrups and very light saddles. There are three main types of shooting. The first, and most common, involves releasing the arrow at a target directly to the side of the archer from about 10 feet. Targets can also be placed obliquely to the front of the archer's path, or up to 50 feet away. "When people think of the samurai, they don't realize that in the old days, archery was more important in battle than swords," said Hisashi Yoshimi, one of the featured shooters at the beach competition. "Archers didn't shoot at targets close up. They kept a distance and fired upward so that the arrows would rain down on advancing troops." Yoshimi said that tradition is reflected in the longbows, which are better suited for long-range attacks on a general area rather than picking off single adversaries. "The bows haven't really been adapted for this kind of shooting, because there is a big part of the sport that is spiritual, rather than practical," he said. "That's a lot of its appeal." I didn't think it would be quite so heavy for as short as it is but is has a good balance to it and is sturdy as can be, I could probably lop down a several trees with it! 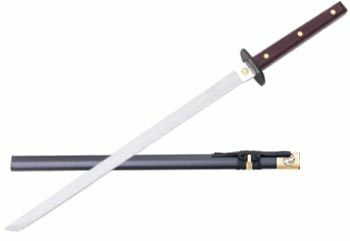 Thanks for sharing about the Yabusame, I had never heard of it before. Are there any links to some video of it? I think this would be really neat to watch. Hi McRoach. I am happy about your new sword. That's good to hear. Trees huh.. I always liked watching the Huns as well. The shorter bow sounds like it would be easier. Anyhow good luck in your searches. I hope these links helped.